'With one of my favourite studio wizzards and multi-task-instrumentalists Jan Weigel I recorded some random samples from old reel-to-reel tapes of his father...we also used the tape machine to record drums and piano onto the magnetic tapes for unique texture, saturation, distortion and low fidelity. Kloing. Chzzz. Nnnpf. Primarily OUTTAKES is a series of musical compositions - songs, beats, tools, recordings and sonic fragments designed to encapsulate a time, vibe and feeling. These collections will see Cord Labuhn open up a selection of his personal folders and archives to give listeners an intimate insight into his mindset and creative processes whilst simultaneously showcasing the talents of some his closest friends and supporters. 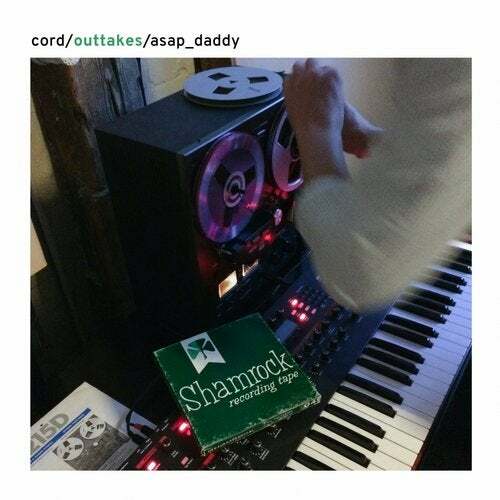 After a lifetime of crate digging and absorbing music, OUTTAKES sees a rejuvenated Cord go back to his roots and follows a rekindling of his love affair with Hip Hop that saw him hit the studio with iconic names such as KRS-One, Masta Ace and Jeru The Damaja. Coupled with the recent geographical displacement of Robosonic - fate and the Atlantic Ocean have separated the pairing, with Sacha now residing in Los Angeles whilst Cord continues to live and work in Berlin - the time was right to think outside of the box with the creation of an outlet for these evolutionary 'works in progress'. Aiming to channel the spirit of the memories that helped him form his cultural and musical identity, OUTTAKES won't be limited to sonic offerings and will include photographs and video footage in its bid to tackle 'real life matters'. What Cord means by this is open for interpretation but one meaning he attributes to the phrase is it being a metaphor for physical products you can touch, trade and give-away. Known for his affection for towels - stick with us here - he's also applied his mind to the invention of a towel/scarf hybrid which he calls PUNCHI and uses and distributes around the necks of likeminded people and wet cats. In the tradition of creating physical product to enhance the musical experience, further opportunity for fans and followers to show some love and support for the free floating digital content on offer will follow with the opportunity to purchase items from his soon to be launched OUTTAKES category on the PUNCHI store: www.punchi.de/outtakes. To receive downloads and to catch up with the continually evolving OUTTAKES collection by periodical love letters, make sure you sign up for the newsletter at www.outtakes.co or mail to outtakes@cordlabuhn.com. This email address can also be used to contact Cord regarding feedback, sponsoring and collaboration opportunities in addition to his social media channels which can be found below.